Info: This feature requires Elvis 5.23 or higher. A Webhook is a small piece of code attached to a Web application that listens for specific triggers and then performs a predetermined action. Webhooks allow you to automate processes that previously had to be scheduled. In Elvis, Webhooks can be used to notify your application when certain events occur in Elvis. Example: You might want to alert and respond in your remote application when asset metadata is updated or when a Share Link is created. When a defined event occurs, a HTTP POST with the event payload is sent to the URL that is configured in the Webhook. Subscribing to events using a Webhook means that your application does not have to periodically poll Elvis (via the REST APIs or through a Scheduled Plug-in) to determine whether changes have occurred. Tip: To learn more about Webhooks about what they can do for you when using Elvis, read our Blog post. To use a Webhook in Elvis, it needs to be registered. This can be done by using the Management Console or through the Elvis REST API. Step 1. 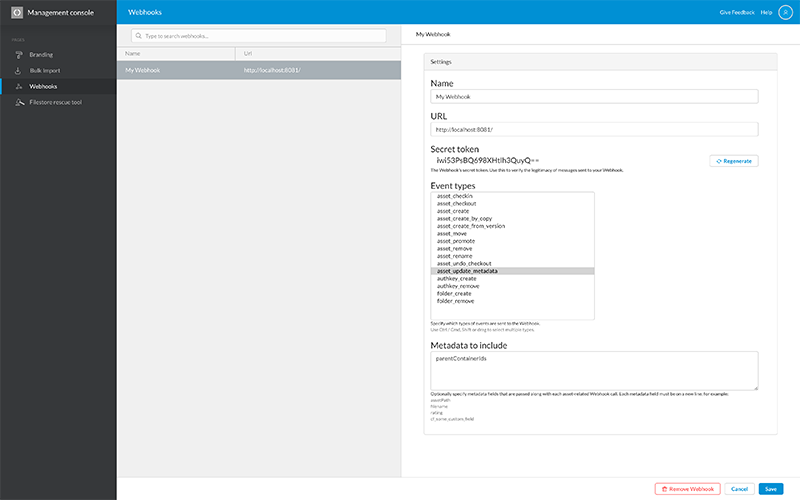 In the Management Console, access the Webhooks page. Step 1a. 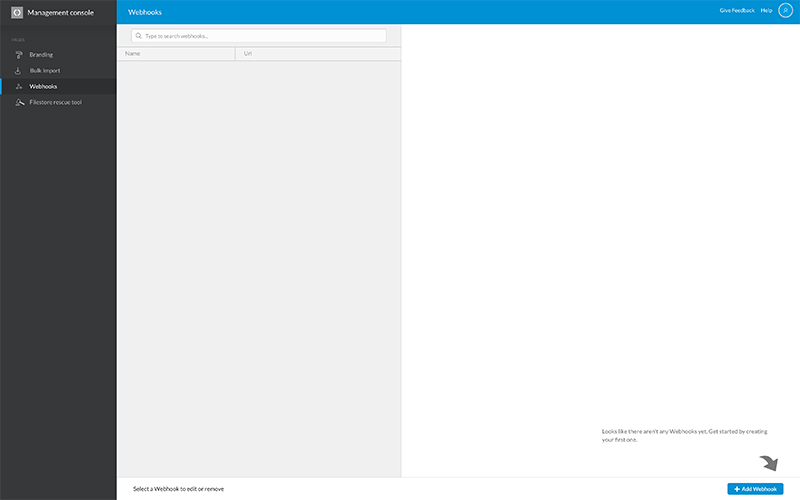 Log in to the Elvis Pro client, click your Avatar and choose Management console from the menu. Step 1b. From the menu on the left of the page, choose Webhooks. Step 2. Click Add Webhook. Step 3. In the form that appears, enter all details for the Webhook. Note: For more detailed information including examples, see Elvis 5 REST API - Managing Webhooks. Optionally, the JSON object may contain a list of metadata to return. The response will contain the full Webhook object in JSON format. 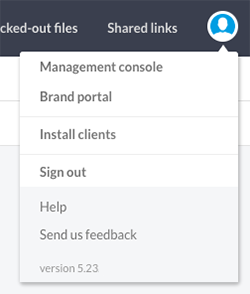 Updating a Webhook can be done by using the Management Console or through the Elvis REST API. Step 2. In the list of Webhooks, select the one you want to update. Step 3. Edit the details and when done click Save. Step 1. Create a JSON object that contains the fields you wish to update and their new values. The response will contain the updated Webhook object. Generating a new secret token can be done by using the Management Console or through the Elvis REST API. Step 2. In the list of Webhooks, select the one for which you want to generate a new secret token. The new secret token will be displayed. The response will contain the new secret token. Unregistering a Webhook can be done by using the Management Console or through the Elvis REST API. Step 2. In the list of Webhooks, select the one you want to unregister. Step 3. Click Remove Webhook and confirm that you want to perform that action. When successful, Elvis will send an empty-bodied response with a 'No content' status. Webhook payloads are sent over by HTTP. In order to receive them, a Web server needs to be set up which can be reached by your Elvis server. After configuring your Webhook in Elvis with the URL to the Web server, Elvis will start sending payloads to that Web server. On normal Webhook calls, Elvis expects to receive a response with a status code in the 2xx-range. When Elvis receives a response status code in the 5xx-range, the Webhook call will be retried a maximum of 8 times with increasing delay or until a successful response has been received. If Elvis receives status code in the 4xx-range, it will not retry the call and instead report the response body as a warning log. For a sample of a Web server in NodeJS which is set up to receive Webhook payloads from Elvis, see our Elvis Simple Webhooks Sample on GitHub. 9 May 2017. Added references to the 'name' field of the Webhook.